Email addresses are very personalized, and they are a reflection of you whether you realize it or not. So, for a marketer how can this be useful? It’s more useful because they are learning more things about you than you need to tell them. This makes it easier to create targeted emails based on a few assumptions. When you can create more relevant content then you have a higher chance your audience will engage with you better. As a digital marketer, you probably have most of your lead gen pages as a first name email submit. While this is the entry to building a relationship with your customer you are not collecting a whole lot of data. 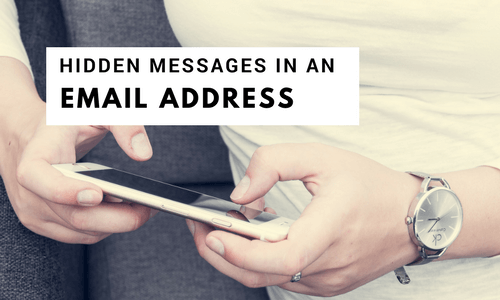 But, take a closer look at the email address to identify what hidden messages you can learn. Now that you know the users first name, you can segment your users based on gender assumptions. Some may be simple guesses such as Crystal would be a female, and John would be a man. Others that could be more challenging would be names like Jessie, Jody, Logan or Tommie because they are identified as unisex names. Even if the user did not tell you their full name, maybe their email address did. Many business email addresses formats are FirstName.LastName but users also do this in their personal email accounts. Keep in mind some of the individual email accounts may not be separated by a period because many do not allow that in their formatting. Its possible you could learn the age of a handful of your subscribers if they happen to have a few numbers at the end of their email address. For example, LindsaySmith90@yahoo.com would allow me to assume this user was born in 1990. Or keep your eyes open for an email formatted such as MariekMoore1956@aol.com, it is easy to agree this user was born in 1956. Some users create email addresses around some of their favorite things such as sports teams, favorite colors, movies, etc. An email address can sometimes tell us multiple things about the user. If we look at an email address such as Ilovemypug1980@yahoo.com this email address we can assume the user is a pet owner, has a pug, likely a female, and born in 1980. Based on knowing that information a digital marketer can send offers like pet insurance, pet supplies, small dog clothes, etc. Another interesting article I came across dives into further analysis about your personality based on the type of email account you create. Basically stating that if your personal email account is @aol.com, then you are probably one of the first home internet users. Likely you had this email account for ages, or you are just part of the older low-tech generation who never moved on to something more sophisticated. Even @Yahoo accounts got about the same level of shame. @hotmail is a sign that your email address is old, but not ancient. However, if you have a @gmail account then you are pretty much keeping up with the times or likely someone younger and up to speed with the way technology changes. While these points may be interesting things to keep an eye out on to get a leg up on competition, it is equally as essential to ensure you have clean data. Keeping good quality data means you will have more consistent deliverability. Always validate your data before adding it to your marketing funnel, just because ilovemypug1980@yahoo.com looks like a proper email address but, it’s not currently valid, so it doesn’t make sense to waste time on it.